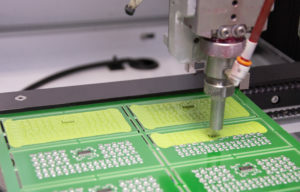 Seven next generation UV cure conformal coating products will be launched for the first time in Europe at the SMTConnect show In Nuremberg, hosted at the Nurnberg Messe from 07-09 May 2019. Electrolube, the global manufacturer of electro-chemicals, developed the exciting new UVCL range to meet the various requirements of electronics, LED and automotive manufacturers, with the additional benefit of rapidly increasing production time and offering even higher levels of performance. The new UV Cure range will be showcased in Hall 4, stand 339, where Electrolube’s senior technical team will be available to discuss the advantages and specifications of the new UV cure coating range. The UVCL range is solvent-free, VOC-free and provides unsurpassed performance in harsh environments, including resistance to cracking during thermal shock cycling. The main benefit of Electrolube’s UV Cure coatings is that boards can be handled immediately, with full cure guaranteed within 6-12 hours due to the chemical secondary cure mechanism. In comparison to existing UV cure systems on the market, the majority require minimum moisture secondary cure times of 8-14+ days, whereas the new UVCL range facilitates tremendous reductions in the amount of Work In Progress. The range features UVCL, a single component, medium-low viscosity dual cure coating with secondary moisture cure, for complete cure in shadow areas. Available in 5L packaging, UVCL is VOC-free, non-flammable and demonstrates excellent electrical properties. The coating provides a wide operating temperature range and is ready to use for selective spray application. Further UV Cure coating products will be launched at the show and include a brand new film coating product, UVCL-FC, which enables the application of even thinner coatings and faster curing line speeds. UVCL-FC is a low viscosity, fast-curing UV formulation for rapid processing. The company will also showcase a new UV cure coating specifically for LED applications. The UVCL-LED coating is also a low viscosity coating that enables rapid cure with low energy 365nm LED lamps. This entry was posted in Europe, Global, North America, On Ticker, top articles, UK. Bookmark the permalink.